For the past several weeks, I have been wondering why my laptop is still somewhat slow, but still acceptable, sometime after upgrading the DDR2 laptop RAM from 1GB (2 512MB) to 2.5GB (1 2GB, 1 512MB). This problem is even more obvious when playing 3D games, editing my vectors after zooming in a lot, or playing videos at 1280x720 (720p) or higher with sharp details or a lot of motion. Just a while ago, I checked the battery icon to click on it and saw something like the image on the right. 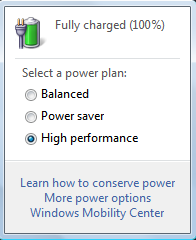 To my shock, the "balanced" option was selected. That would explain everything as I never checked it for a very long time as I rarely bring the laptop out of the house (let alone my bedroom) as I would otherwise refer to it when running on battery. I was also expecting it to switch modes when running between plugged in and on battery power. I use this laptop most of the time as it's the newest computer in my house bought slightly more than a year ago (end-2007; Centrino Core2 Duo). Other computers are desktop PCs that are quite old, the oldest and still working was made 11 years ago (1998; Pentium II) and my previous primary PC is made 6-7 years ago (2002; Single-core Pentium 4). The rest have faulty motherboard due to wrong insertion of RAM cards (not sure how that is possible myself, and it caused everything connected to it [including keyboard and hard disk] to fail) when switched on, failed non-standard power unit, faulty processor cooling fan, or had one of the resistors "exploded" with a strong burnt smell. Before it exploded though, I noticed that it was somewhat expended. Other problems include a failed hard disk that rattles when you shake it a bit, a DVD drive that refuses to open the tray after pressing the eject button, a built-in LAN port that doesn't work even after installing the drivers, a 1997 CRT monitor (plugged between the 1998 PC and the laptop) that appears dim even after adjusting the contrast and brightness, and a 512MB micro-SD card that refuses to read (all the card readers I put this in says that no card is inserted). That's why backup is important: you never know when it would happen. Signs that a hard disk is failing includes the drive being loud when read/write. You probably meant a leaky capacitor by "exploded resistor". Quite a problem for boards in the days before they swapped to solid ones.